Mr. Claussen was my sixth grade teacher. He was one of those teachers that you both loved and feared, but all these years later, he is one I remember well. In our small town, there was always a contingency of half a dozen just-out-of-college teachers who came to town to work in our school system under the guise of getting some experience. This meant, they stayed for a year or two and then moved on to the greener, not so many, pastures of the big city. Once in a while one would stay because they married a local, but mostly they came and went. Mr. Claussen, however, came to town with several years of experience and some innovative teaching techniques that sparked something in our schools. He also ignited something on the playground. Sixth grade students were treated to a teacher who played alongside them at recess. Up until now, the lovely elementary teachers were all well-groomed, proper ladies who wore dresses and heels and huddled together out of the wind next to the playground while we students let off steam. Not Mr. Claussen. He loved baseball, and we all quickly learned that to survive 6th grade meant you better jump on that bandwagon with him. This was rural Kansas, where a couple of television stations could be had if the wind blew just right, and the radio stations were mostly tuned to grain and livestock reports. The Kansas City Athletics (the closest major league team to the east) had just moved to Oakland, California (now the closest team to the west), so you can see we did not have much baseball in the neighborhood to cheer about. Not so on the sixth grade portion of the playground. There were 22 in our class who rotated around to all positions, except pitcher â€“ Mr. Claussen pitched for both teams. He was also the umpire, and every pitch was a strike, so we learned to swing at everything. There were no set times for recess. When things closed in around us in the classroom, our teacher/pitcher/umpire wrangled us outside onto the dirt diamond. Mr. Claussen was a St. Louis Cardinalâ€™s fan. He brought a national newspaper in every day and slipped it into a wooden contraption that held the pages apart and allowed him to hang it from a stand with little dowel cutouts. There was always a weekâ€™s worth of papers hanging in our classroom and each student was expected to spend some time reading so they could talk about a current article at the drop of a hat. More importantly, during baseball season, we were all supposed to scour the sports page and be able to talk about the Cardinalâ€™s box score at any given moment. The Cardinals played the Detroit Tigers in the World Series that year. Mr. Claussen had a radio on his desk and bases on the floor of the classroom. During the playoffs and the series, each morning we drew a paper out of a basket with the name of a player, or a job on it. 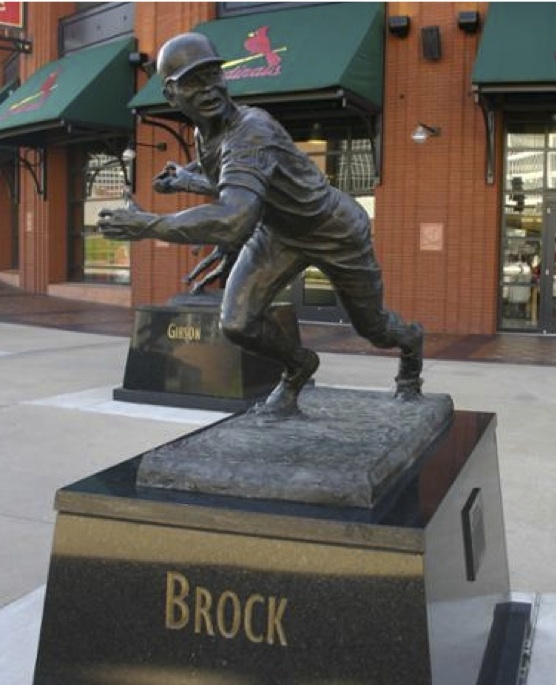 When the game was on, we worked quietly in our work groups and when your player was up to bat, you took your place in the batterâ€™s box and ran the bases according to what the announcer, Jack Buck, reported. There was a big scoreboard on the blackboard that a couple of students kept current. We mimed the actions of players like Lou Brock, Orlando Cepeda, and Bob Gibson. On our backs were paper numbers of the player we represented. Our challenge was to cheer loudly enough that the principal would come and ask the score. The major leagues had come to our home town. Many years later, I moved to St. Louis and worked downtown just a home run ballâ€™s distance from Busch Stadium. At lunch time I walked around the stadium among statues of the players and managers that we had pretended to be back in my sixth grade classroom. I slipped into a fair number of Cardinal games and became a fan all over again. The Cardâ€™s won the World Series that year over the Milwaukee Brewers. I cheered loudly that year too â€“ and I sent a postcard to Mr. Claussen. Newer PostBottom of the 9th, #37 – Which Wolf Wins?